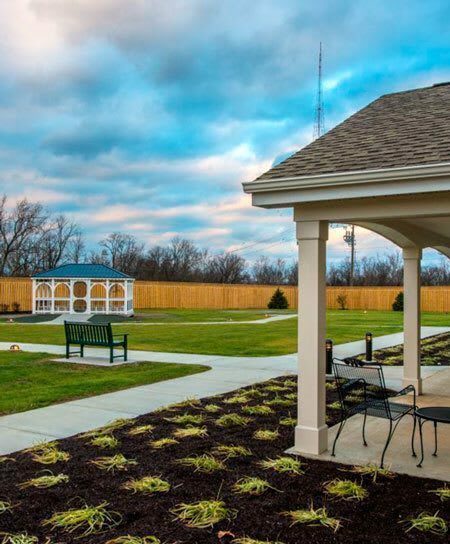 Residents at Artis Senior Living of Bartlett live in one of four neighborhoods that converge in the Town Center. Each neighborhood includes a kitchen, dining room, family room, access to a private courtyard and garden, as well as individual suites. Each memory care neighborhood features a distinct theme with residential finishes for a comfortable and familiar feel. Browse our sample floor plans to get an idea of how each resident’s individual suite will be laid out. Memory care suites accommodate a full-size bed, bedside table, dresser, lamp, chair, and other personal pieces of furniture. Located at the entry, you’ll find a personal memory display case for photos and mementos. We encourage family members to help residents furnish their suites with personal and familiar belongings. Furnishing can also be provided by Artis Senior Living. In addition to spaces designed for social engagement and connection, we pride ourselves on providing residents with quiet, peaceful spaces. We believe that through two-way communication between care partners and residents, we can create the ideal environment for health, wellbeing, and fulfillment together. Contact Artis Senior Living of Bartlett for more information about our memory care community.